New experience of enjoying 5.8 GHz+2.4 GHz dual band with OFDM wireless technology,it presents less interference while works at 5.8 GHz frequency,and provids better transmission with its 433Mbps data rate,the unique design brings easy and free wireless digital life. Thank you for purchasing the wireless 802.11b/g/n/a/ac USB adapter!This adapter is mini size design and you are able to plug it into the USB port.Excepting common wireless standards 802.11b/g/n,this wireless adapter is also 802.11ac compatible -data transfer rate is 300/867Mbps,and that three times faster than 802.11g wireless network! 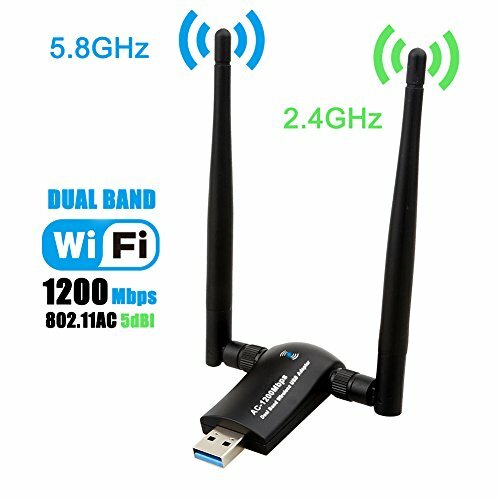 【EXCELLENT WI-FI SPEED】- Upgrades PCs to 802.11ac with Ultra-fast AC1200 wireless adapter speed, You Can Get 867Mbps Wireless Speed on 5GHz WiFi Band or 300Mbps Speed on 2.4GHz WiFi Band.Performance to reduce freezing and lags for gaming online and seamless HD video streaming. 【SIMPLE INSTALLATION】 - With USB 3.0 socket, comparing with competing products, ours are easily connected to computers or other devices, as well as it's 10 times faster than 2.0, and there is no any complicated operations to install. 【Wi-Fi Hot Spot】: You can create a Hot spot with the Soft AP Feature if your computer is under wired Internet connection. You can boost Wi-Fi to your mobile devices from your computer. 【Warranty Service】: We provide 24-Month free Warranty. Please contact us if you have any problems about the usb adapter, we will respond to your issue within 24 hours. If you have any questions about this product by TECHKEY, contact us by completing and submitting the form below. If you are looking for a specif part number, please include it with your message.